This Saint Patrick’s Day The Irish Experience offers you our amazing and unique Sea Cave Kayaking Experience along the visually stunning South East coastline of Ireland, taking in the very best Atlantic Ocean location of Ireland’s Ancient East. Sea Cave Kayaking is a truly unique and exhilarating way to explore this magical coastline. The visually stunning natural area around The Hook Peninsula in County Wexford is steeped in jaw dropping historical stories with a rich heritage and diverse wildlife, all of which you will enjoy during this unique St Patrick’s Day Experience. We have an impressive variety of coastline packed with hidden gems including; golden sandy beaches, coves, cracks and crevasses which comprise of an impressive variety of Sea Caves. This includes one of the most impressive examples of a natural Sea Cave you will ever see or have the pleasure to enter by kayak! All this is ready and waiting for you to explore with us! You may be lucky enough to spot our local seals who occasionally tail our kayaks to see what you are up to! We’ll find a hidden beach to land and re-energise you with a mid-tour hot drink & snack included! We challenge you to leave your comfort zone and jump into your adventure zone! Here we will greet you and provide you with all the necessary gear before we visit our epic launching location and hit the water! Note : Check in at least 15 minutes before the tour start time. It was that Saturday in March whereby the weather completely forgets what month it is and fast forwards to Summer – a gloriously warm, clear day. Myself and the other half had signed up to a Mountain Explorer Experience with The Irish Experience. An eco, adventure tourism company founded and based in the Sunny South East. The day started in a café of a service station in Lemybrien, Waterford. Here we met our guides for the day. Graham Doyle – owner of the Irish Experience – a ball of enthusiasm and energy, a clear passion for adventure and a bit of an adrenaline junkie. William Nolan – mountain guide, a wealth of knowledge and experience on all things mountaineering and climbing, an impressive resume of climbs and a really nice guy. A ten-minute orientation on what to expect for the day with the group (5 of us on this particular day) and then we were off up the road to park at the foot of the Commeragh mountains. Fitness wise I would say a moderate fitness level is required but we did stop frequently to take in the surrounding views and to do a little bit more map reading – leaving plenty of time to take a breather. At the summit we found a sheltered spot and sat for lunch. Now, there is dining alfresco and then there is alfresco dining at the top of a mountain in the Irish countryside. What a view! We had packed our own lunch and this was added to by Graham who rustled up hot chocolate for everyone along with a flapjack – the most enjoyable hot chocolate I think any of us had ever had! The whole loop covered about 7.5km and we completed it in about 5.5 hours and we had a bit of a sit-down and debrief once back at the carpark. As well as some fantastic photos, great laughs and a confidence boost we took away some skills that we can work on and develop for future adventures into the mountains! After deciding to select a permanent base for our Mini Sea kayaking Tours and Kayak rental we just could not look past Baginbun Bay on the Hook Peninsula in Co Wexford as the prefect location. Baginbun bay ticks all the boxes, it has so much to offer in terms of sea kayaking. 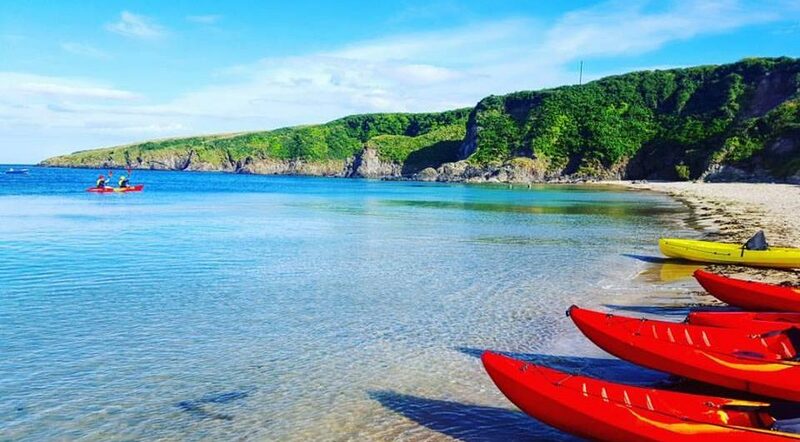 It boasts beautiful sandy beaches and incorporates a dramatic rugged coastline including sea caves, coves and marine wildlife which are perfect for exploring on a sea kayak. Importantly, Baginbun Bay is mostly a very sheltered bay, protected by a large outcrop of land which jolts out to Baginbun point. The main beach sits low down protected by the cliffs above and is an ideal place for novices, families and the kids to take to the water safely. This week we are delighted to announce the launch of our Mini Tours! This coincides with our presence in Baginbun Bay on a regular bases. The Mini Tours are designed for folks who just want to get out there and give it a go in a guided and safe environment. Kids and adults alike are very welcome to come out and Experience the best of what the Bay area has to offer. The Mini tours have a duration of 1.5 hours on the water and are fully guided by a Sea Kayaking Coach who will provide tuition along the way. Safety equipment including Buoyancy Aids and Helmets are provided as part of the tour. We do recommend that you take a bottle of water with you and some footwear you don’t mind getting wet! We don’t advise that you bring your phone but don’t worry we’ll take a bunch pictures that we’ll share with you afterwords. Just rock up and hit the water! Some people just want to get out there and do some exploring with friends and family without our qualified guide. If you have the knowledge and confidence to paddle independently, then we encourage your adventurous side and provide you with the equipment. All personal safety equipment included with your kayak rental. More dates to be announced soon… keep up to date on our facebook page! The road to success is a long and winding back road, full of pot holes and fallen debris. The reality of travelling on this road is you never can be sure that you will ever reach your destination. But for most of us who do take this road we share one common denominator, belief! belief in ourselves and in our goals, belief that with sheer determination and grit that we will eventually arrive at our destination relatively unscathed. For anybody who has followed us over the past few months or year you won’t be handing us out any medals for a speedy business start up. I don’t want to use the term “Rome wasn’t built in a day”………ah feck it, Rome wasn’t build in a day! At the end of January this year I essentially finished my management degree in adventure tourism, all but one semester of work placement that is. Since the start of February this year I have been given the opportunity to channel 100% of my time and effort into The Irish Experience Eco Adventure Tours. It is living the dream, but without the benefit of being able to wake up during those hairy moments when you know you need to get the hell out of there! Of course it has been hard going at times, issues such as finance, public liability and insurance have been major sore points of late, we have took many a heavy blow to the upper body but haven’t yet been knocked out. Just to give you a taste of what we are up against, after our purchase of our gorgeous new 9 seater Nissan adventure wagon a couple of weeks ago, we have yet to actually secure insurance to actually use the wagon for business purposes. Phrases such as “this isn’t one for us”, “this is outside risk appetite” and “this would not fit our criteria” have been heard no less than 18 times from a variety of insures across the country. The case is now going to the insurance federation of Ireland for review. But don’t worry we don’t do dome and gloom here at The Irish Experience! Its even in our tag line, we just “make it Mór”! ( Mór is Irish language for Great/Large). We are very proud announce that we are launching our website in less than a fortnight! We have secured a deal for a fleet of brand new kayaks and everything we need for transportation the kayaks! Purchased our amazing “Adventure Wagon” and have deals set up with various accommodation providers to deliver an outstanding experience, The Irish Experience.